Alex struggled with obesity and it’s side effects, but his decision to eat better and exercise helped him lose 80 pounds and identify his true friends. See how he re-made himself! Being the fat kid is never a great label. I always wanted to change, although I could never find a way to lose the weight all throughout high school. 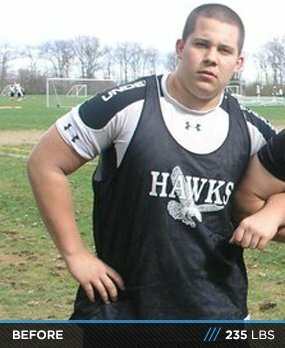 I was a lineman for my high school football team, so I always made an excuse saying "I'm a lineman, so I have to be overweight." Every summer during workouts, I always told myself I was going to lose weight, but I never did. That excuse propelled me to the lowest point that I have ever been at. Just like everyone knows, the fat kids in school get picked on, but I was never the one to complain about it because I let myself get like that. However, the constant abuse for it, even in a joking fashion, takes a toll on a person. I was depressed all the way through high school, though I always had a fake smile on. Only the person who is overweight knows what is actually going on in their head, and when left alone, their thoughts are probably not on the positive side of things. Towards the end of my senior year and continuing through the summer before leaving for college, I found myself in the darkest place possible. At times, I thought about ending it all because it would take away from the pain of waking up and having to deal with myself. I was sick of not swimming with all of my friends, or not feeling comfortable eating in public because I was scared of people making fun of me. The constant tension in my own mind was too much to bear, so on one of those very depressed days, I made a decision. I had two choices, end everything and take the coward's way out, or turn my life around and make every person who had ever pushed me to the edge feel sorry that they hadn't helped me. I was moving 12 hours away from home for my freshman year of college, and I decided to make that year my "fat camp" year. I was so excited with the thought of a new beginning that I dove into a new lifestyle, and never turned back. I started first by finding inspiration. I believe that proper inspiration will get any person through any troubles that they face. I knew I never wanted to feel like I did before, so that alone was enough inspiration for me. Next, I had to find motivation. I found motivation in getting back at anybody who had ever made fun of me, getting back at anybody who had ever told me I would not be able to change, but for the most part, the mirror was my motivation. I used my negative attitude and negative outlook on myself to propel me into the hardest and longest journey of my life. Next, I had to gain the knowledge on how to lose the weight before I could just start losing it. Watching many YouTube videos had helped me figure out the right foods to eat on a bodybuilding diet, and then I tailored those good foods to my own bodies needs. I found out how much of each macronutrient that I needed, and this helped more than you could believe. I never looked into diet when I was trying to lose weight before, although diet is such a vital role in weight loss and muscle building! I then planned out my lifting/training routine. I had already been powerlifting for five years before this transformation, so I had a very good base to start with. It was just a matter of adding in more contraction movements and more isolation movements to shape some of my muscles and bring up some lagging muscles. 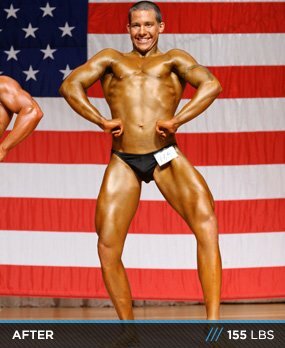 After I had a complete journal with a meal plan and training plan down on paper, I got started. One setback I did have with my nutrition was dorm food. I was a college student on a very limited budget and only two to three meals a day. I had to make my meals count, eat the highest quality possible food, and make sure I was getting in all of my nutrients during those few meals that I had. During my pre-contest diet, I took in a number of different supplements to fill my deficiencies, although here are the main supplements that I could not have lived without during my transformation. During my freshman year, I was limited to the food that I had on my food plan from the dorm foods. Although after switching schools, moving closer to home, and having my own kitchen, I can now stick to a more structured, healthier diet plan. I designed my diet plan my freshman year by looking at a structured diet, and improvising with what I had. Here was a general guide to my transformation diet, as it would change daily based on my needs and available food. Depending on my thirst, I would consume 1-3 gallons of water a day. I made it a point to get at least 1 gallon at a minimum. Take into consideration that this is a generalized program that has been lumped together from what a normal week consists of. I believe that you should do what your body tells you to do, so my sets, reps, and even lifts if they need to will change according to how my body is reacting. Also, the reps that I have indicated are also not set in stone like you will see them, and take into consideration that in every consequential set, my weight will be increasing. I like to throw drop sets into my lifts if I have any extra energy, but I am a firm believer in increasing weight. During my transformation I was doing morning and night cardio. During my general weight loss, I was doing around 45 minutes to an hour almost every day. Pre-contest for about two months, I was doing about 30-60 minutes of cardio in the morning, and finishing up the cardio all the way to an hour total for that day after my lift if I did not complete the full hour of fasting cardio. Many people may believe this is too much volume, but I come from a powerlifting background, and I have been used to long, drawn out sets. So switching over to bodybuilding where the focus is primarily on the contraction and blood flow, doing 8-10 lifts per muscle group is not uncommon, or challenging at times for me. If you have a dream, no matter what that may be, no matter how stupid or silly it may seem to other people, even your family, if you truly and firmly believe in it…go get it. Through my transformation, I have come to realize that your mind is what will make or break you. Your family and true friends will be behind you and supporting you no matter what endeavors you may face, although your mind if it is not ready for what you want will break. Strengthen your mind, and you will succeed. I found that isolation, and only believing that I was on this planet for this one goal was my only calling. I did what I had to do, including schoolwork so I would be able to get to where I wanted to be. Shedding the pounds, or gaining the muscle doesn't really matter when it comes down to it. What matters is what you want, and your own personal goals and self image. We all strive to look our best. Imagine that perfect you, see it in the mirror even when the mirror does not reflect it, set out a plan, make realistic goals, and go get it. Even if it takes 10 years, that one day when you reach your goal will be the most breathtaking day. 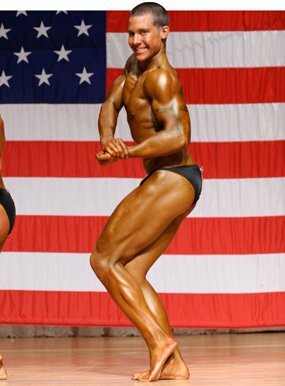 For me, stepping on and off of a bodybuilding stage was the most amazing thing I have ever done, and my first show (April 21, 2012) will forever be the greatest and most important day in my life forever. I have created a new me, mentally, physically, and emotionally, and if you want that same feeling I insist you find out what it is like. Believe in yourself and you will succeed. I would like to take a second to first thank my parents. Truly, without them none of this would have been possible. 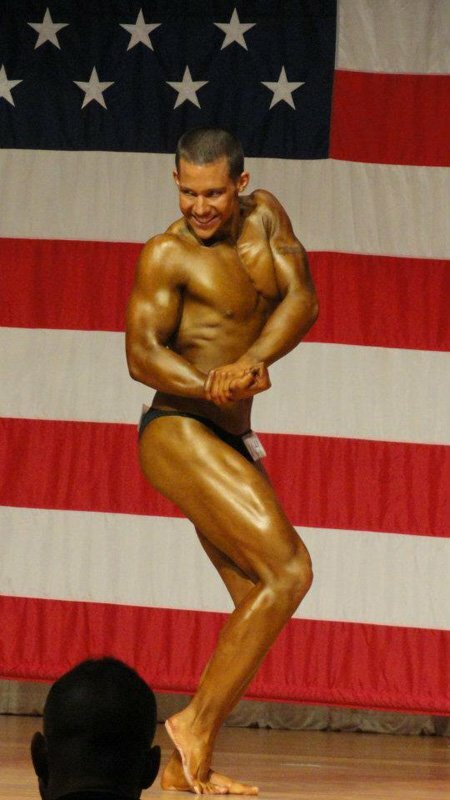 There is not one, or very few teen bodybuilders out there that have the income and stability to pay for their own nutrition, supplements, and competition fees. That being said, diet is a huge part and they helped me a ton with the food shopping. Having a house that I could be up all hours of the night coming home or going to the gym, prepping my meals, doing homework and showering interrupted their sleep habits but they knew it was for a good reason and they supported me as much as they could have. Next, I would like to thank my trainer Tracy Carson. She has been one of my biggest inspirations and role models. She took me in and trained me when I had no money. This was one of the nicest things anyone has ever done for me. She was training me out of the kindness of her heart, and on top of that she was there to contact day and night for whatever reason (training, diet, emotional stability) and would never turn her back on me. Without Tracy, I would not have made it to my first show, and I would not have the lifelong friend that I do now. Many people have their significant others turn on them during their diet for a show because of the mood swings, and eating. I could rarely ever go out to eat, stay out late, spend money for leisure, or go to any parties, and my girlfriend not only stayed behind me but supported me and encouraged me all the way through to my show. Not only did this take stress off of me, but actually made my dieting and emotional stability a lot easier to handle. I may not have told her enough, but thank you Anna for being such an amazing girlfriend and friend. Finally, my real backbone. My friends, you know who you are, were there to pick me up when I fell, push me through the grueling lifting sessions, keep me up at night for cardio and push me in the morning for cardio if they were willing to get up. I can't thank them enough, and not only were they just there for me; they went through basically all of it too - minus the diet. If you don't know what it's like, having a group of friends who are willing to sacrifice literally blood, sweat, and tears to help you accomplish your goals - it's the best feeling in the world. My friends, family, trainer and girlfriend absolutely mean the world to me and if it weren't there I would never have made it. Thank you guys so much.